Developing scalable web applications for you without compromising on security and reliability. SushTech’s skilled DOT NET developers have the vast technical expertise to deliver scalable ASP.DOT NET product development services in the specified time duration. Our proficient DOT NET team works with you to understand your business requirements and provides comprehensive solutions accordingly by using the complete range of DOT NET functionality. Our DOT NET product development solutions facilitate you to meet every challenge efficiently. By using our capabilities in Dot Net Development Solutions we provide you abundant information technology-based business solutions, which puts you way ahead of your competitors. We are very proficient in technologies like Agile & Scrum development. Although open source technologies are quite alluring because of the affordability and lack of restrictions but when it comes to security and reliability you have to think twice before choosing the same. This is the very reason why the organizations which are really concerned about the safety and trustworthy source chose Microsoft’s .NET technology. ASP.NET is a software framework developed by Microsoft which is very helpful in creating dynamic web applications. The framework provides better performance in comparison to any other framework with scripting language. 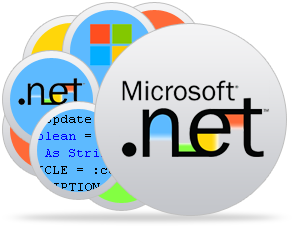 ASP.NET helps to deliver comprehensive and well integrated web applications in shortest possible time. It connects a wide range of personal and business technologies, which gives the access to vital information, anytime and anywhere it is required. It increases productivity because of high speed of development. Features of cross platform migration make it unique.